If you’re paying attention to fashion headlines, you’ll notice constant reminders that the industry is moving in a more inclusive direction. Model Teddy Quinlivan has become a champion for the trans community, Edward Enninful launched a new era of British Vogue with diversity at the forefront of its mission, and of course,non-“straight-size” models continue to find their place across the runways of fashion week. However, when it comes to plus-size fashion specifically, one designer says there isn’t a future for it—but that’s not as discouraging as it may sound. Alex Waldman, co-founder of Universal Standard, a brand that makes clothing exclusively for women who wear double-digit sizes, says that the future of fashion has fewer labels, ideally speaking: “If we are still talking about plus-size fashion in the future, then we’ve all failed. 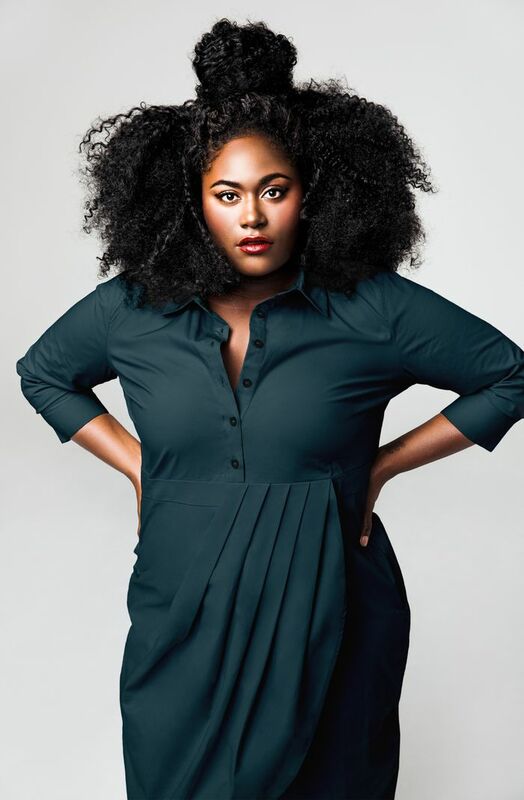 It’s got to be fashion for women, and that’s it.” In continuing to offer better options for women size 10 and above, this week, Universal Standard released the second round of its Tria Collection, teaming with Orange Is the New Black star Danielle Brooks. The collection’s three designs include a pair of overalls, a knit sweater, and a shirtdress with asymmetric pleating inspired by Solange Knowles. “I think she’s super dope in her colors and trying new things. I cling to everything she puts on,” Brooks told us. Earlier this week, Brooks and Waldman walked us through how they decided on the collection’s three core pieces—each is available online now and can be worn in myriad ways. They also explained how brands like Universal Standard are empowering women to own their sense of style, were upfront about what the industry is getting wrong, and explained why using your own voice is a powerful tool for change. It remains to be seen if the world is ready to ditch the plus-size label just yet, but consider this elevated collection one step—or maybe three—closer. WHO WHAT WEAR: Now that you’ve officially added designer to your résumé, what have you learned in the process of designing pieces for women in double-digit sizing? DANIELLE BROOKS: Well, two things. First of all, Universal Standard has taught me that the possibilities are limitless. You might think somebody who’s done all this stuff [in her career] can do anything, but sometimes you really can’t—you feel stuck, especially in an industry that doesn’t really care about what I put on my body. So Universal Standard has given me that, and that’s really a gift. And second, I thought I knew (because I am double-digit size) about material. I thought I knew what felt right and what worked under the arms, and there was so much to learn in that way! It’s been a great collaboration because they’ve been so willing and graciously giving me information to know for however I plan on taking this further. WWW: Tell me about the pieces. What weren’t you finding in these styles before? How did you make them the best possible for this customer? DB: These pieces you might think you’ve seen before, but what makes them different is you take the off-the-shoulder dress, and it’s converted into a hooded-shoulder dress. That’s new and something I’ve always wanted. You can wear that with a boot or a nice necklace or whatever. And the shirtdress, you could wear it with a belt, you could wear it with the bow tie, you could wear it with a fedora. I just threw on some jeans and called it a day! ALEX WALDMAN: That’s actually something Danielle wanted when we sat down. She wanted pieces that you could play with, had different characters and personalities depending on how you wear them, and we wanted to make it really, really cozy and wonderful, so we used an Italian merino wool and cashmere and made these beautiful saturated colors, which is another thing Danielle was very specific about. She had a particular palette, and she wanted it to look good on different skin tones. WWW: So it’s about two years since Universal Standard launched. What have your customers been saying and asking for? AW: We do get a lot of suggestions and requests. One of the things I felt was a little bit awkward about the preexisting plus-size brands is that they do tend to go to the consumer and say, “What do you want us to make?” By the time the consumer has that opinion and it gets back to the big brands, you’re constantly a year and a half behind. So we said, we are going to lead; we aren’t going to follow trends. We are going to create pieces that can stand on their own and are not dependent on any one specific trend so that you can walk into a room and people think you’re stylish rather than the dress you’re wearing is stylish. There’s a difference. WWW: What do you see for the future of fashion when it comes to inclusivity? DB: For me, I want to be able to walk into any store or online and be able to purchase anything. I think that fashion is a reflection of how you’re feeling that day or what you want to put into the world that day, and a lot of the times we are opted out on a lot of those options, so that’s what I hope would happen in the future. AW: My answer is always the same: I don’t think plus-size fashion has a future. If we are still talking about plus-size fashion in the future, then we’ve all failed. It’s got to be fashion for women, and that’s it. WWW: What do you think the fashion industry gets wrong about plus-size fashion right now? AW: The fashion industry underestimates the curvier woman—the plus-size woman, the double-digit sizing, whatever you want to call it—they are chronically underestimating her desire, her wallet size. A size-6 woman does not have better taste; she just has better options. So it becomes a vicious cycle: We don’t have great options, so we don’t look up to par, so we are judged for being less than in terms of style. I think this mentality has been the prevalent mentality in the fashion industry. It’s going to take some time to change that because fashion, by nature, is exclusive, not inclusive. But I think things are beginning to change, and we are going to be leading the charge. WWW: Danielle, you mentioned taking the role of designer further. Is that something you see for yourself? DB: I do see it, but I’m not adamantly hunting for it. Somehow I’ve gotten into the position of leadership when it comes to speaking up for a group of women who feel underrepresented, and I take that on. I am down to be that person. It’s always been important to me to be that little girl I wanted to see. So I step into it, and I hope to be a leader in the fashion industry as well, if that’s what’s meant to happen. WWW: Do you feel like it’s a responsibility seeing that you have this incredible platform? DB: I don’t want to say it’s a responsibility. I think it’s unfair to talent sometimes. What if you just want to be an actor? But when you are given a voice, you should use it; that’s my opinion. And I have a voice, and I plan on amplifying that as much as I can, as I’ve seen my counterparts do time and time again in Orange Is the New Black. Seeing those women stand up for what they believe in and really speaking out, this is what matters to me, and it will always be my world.